Darjeeling hills is seething with anger after Indranil Sen, a minister who is close to chief minister Mamata Banerjee, said on Friday that senior Gorkha Janmukti Morcha (GJM) leaders, including Bimal Gurung and Roshan Giri should be packed in six-foot-long steel boxes and dispatched out of Darjeeling hills after the May 14 civic polls. Sen was speaking at an election rally in the hill town of Darjeeling on Friday. Posters by apolitical associations have come up in the hills to protest against the minister’s statement. A video clip of Sen’s speech has gone viral in social media with thousands protesting the statement. On Saturday, thousands of people in Darjeeling responded to a call given by Gorkha Janmukti Morcha (GJM) and participated in a rally to protest against the minister’s speech. 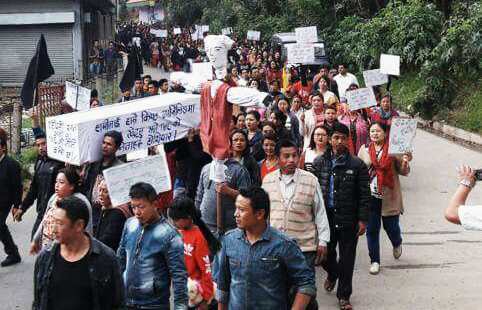 GJM that has interpreted Sen’s statement as an attack on locals by an outsider, organised the protest at the same spot where Sen delivered his speech on Friday. On Saturday afternoon GJM leaders also lodged a police complaint against Sen at Darjeeling Sadar police statement. Sen, who was a singer before he turned to politics also sang two lines of the popular Hindi song and asked TMC supporters to sing along with him. Incidentally, chief minister Mamata Banerjee’s nephew and heir apparent of Trinamool Congress, Abishek Banerjee, and tourism minister Goutam Deb were also present in Friday’s meeting. The development should not amuse the chief minister, who is only too aware that identity is a sensitive issue with the people of the hills. GJM which has kept up the demand of a separate state of Gorkhaland for the civic polls has projected the elections as a Gorkhaland versus Bengal fight. Trinamool Congress, on the other hand, is banking on developments carried out by the state government, creation of separate Kalimpong district and the 15 different development boards the state government has formed for different hill communities. Such has been the anger over the minister’s statement, that even Gorkha National Liberation Front, which is an ally of Trinamool Congress condemned Sen’s remark. “We condemn the statement which was uncalled for at this moment,” said Mahendra Chhetri, general secretary, GNLF. Observers believe that Sen’s comment has the potential of damaging Trinamul’s fortunes in the hills, despite the party making some inroads in the hills. Bengal’s ruling party is making all efforts to register its first electoral victory in the politically volatile hills. Trinamool leaders admitted in private that the party has suddenly been pushed on the back foot. “Land and identity are sensitive issues in the hills and hill Trinamool leaders were trying hard to balance, given that our party is against a separate state off Gorkhaland. This statement has undone a lot of our hard work in the hills,” admitted a Trinamool leader in private.